He traversed time and space with a haggard face, a weathered canvas of many scars. His crown of thorns were the rings of Saturn. His brooding eyes as red as Mars. He lead a fearless cavalry of galaxy gods, who colonized worlds both near and far. They raised their swords, and swung their hammers, steadily mobbing through the stars. Jupiter’s bells of war had sounded against the rumble of stellar steeds. Remarkable mustangs from the deserts of Mercury traveling at miraculously infinite speeds. Cowards die, but seldom bleed. Fools may win, yet never achieve. Instead they deceive through clever means, adorning themselves with the cloak of opulence, filling their coffers with glut and greed. They are the most loathsome legion of hosts, who deliberately murder faith and hope, with fatal quotes, that bind the mind of the deaf and blind with the subtle sturdiness of a sorcerer’s rope. 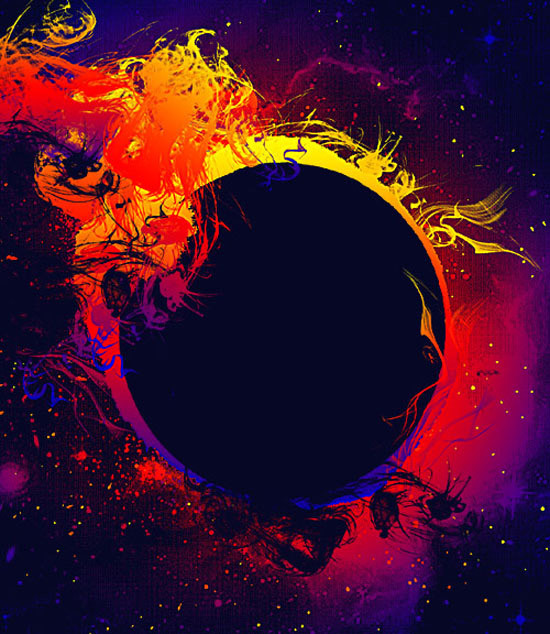 Alas, from the farthest reaches of the universe comes the Black Sun Nefer T.E.M, the priceless light that purchases the night, bringing pomp and promise to every horizon, as the souls of men to take flight and ignite. Conspiring clouds cower before him. Mighty mountains know his name. He’s the lion in the lotus, the heavenly corona enthroned in darkness has mounted his mane. Nefer T.E.M. melts galaxies to fallacies, which ultimately crumble before his spark. Empires of fire are brought to naught by the blazing temperatures of his burning thoughts. Within the cosmic storms of chaos, Nefer T.E.M. is Order’s will and testament, the Magical Gargantuan of the illustrious Milky way, and general of the Black Sun regiment.